A favourite approach for many marketers is known as the KISS Principle – “keep it simple stupid”. It surprised me the first time I heard it, but once I learned it was the design approach used by the US Navy, it quickly impressed me. With increasing competition for customer engagement, this principle is more important than ever before. Simplicity is becoming an essential marketing mindset that benefits loyalty programme operations, propositions and even customer communications. As retailers, taking payment is the only essential step that takes place with every customer every time, and with the increasing dominance of digital payments, the payment card has become the simplest and most effective way that you can track customer purchases and reward them effortlessly. 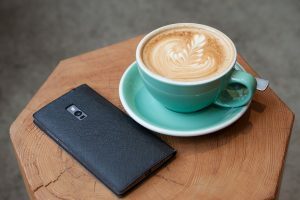 Simply recognising and rewarding customers WITHOUT them needing to present a loyalty card or even scan an app is one of the most exciting ideas in the industry today – and customers of course just love it. Reitan Group is one of Europe’s leading grocery and convenience retailers with almost 40,000 employees across its 3,836 stores in Norway, Sweden, Denmark, Finland, Estonia, Latvia and Lithuania. Within the Group’s convenience retail business units there is a relentless focus on reducing transaction times and eliminating friction, so the team wanted to find a way to recognise their loyal customers so they could be regularly rewarded – but they wanted to avoid the need for customers to present a loyalty card or even scan their app. The solution was the creation of an “autostamps” programme that recognises and rewards members automatically when they pay with a pre-registered payment card. In our article “How To Wow”, we describe the three essential elements your loyalty programme needs in order to delight your customers. It must be clear, compelling and consistent. 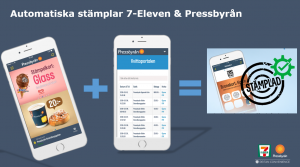 Payment-linked loyalty is a truly compelling concept because it is so easy for customers, and it’s a solution that the Reitan Group has already launched in two of its convenience store chains in Sweden – Pressbyrån and 7-Eleven. Autostamps began as a way to speed up the customer’s transaction time at the till but it quickly became obvious that the idea had other benefits that customers loved – including the ability to send them digital receipts, saving thousands of unnecessary receipts being printed every day. This unique environmental benefit appeals to eco-conscious customers, while also building trust in the brand by ensuring the digital transaction receipts are always available if needed. The automated system has also delivered much more “surprise and delight” opportunities as customers earn rewards more quickly than ever before, by simply ensuring that every single transaction and purchase is automatically recorded. Customers download the retailers loyalty app. Either in-store or online, the customer links their payment card with their mobile phone number and thus their loyalty member profile. Every subsequent transaction using the same payment card is automatically captured and attributed to the relevant member. The customer’s receipts are available to the loyalty member digitally and their loyalty stamps or points are given automatically. The system captures just the relevant information needed to actually award the customer’s stamps. Other items on receipts are not recorded, stored or used, again ensuring best practice in permission-marketing and respecting GDPR regulations. From a systems perspective, some development work was required for the terminal/point of sale to send the receipts to a database. The system migration then ran over-night once the development work is done. The point-of-sale system now sends all of the receipt data electronically to the receipt database – and from there it is shared with the loyalty system, which awards the specific stamps and points to that customer’s account within a few seconds of the customer’s transaction. Along with eliminating the need for the customer to take responsibility for identifying themselves every time they shop, the company gathers detailed transaction data which allows for greater segmentation, personalisation and relevance in its ongoing marketing, which Reitan Convenience Sweden is using to ensure it’s rewarding its most loyal customers the most using tiered rewards. For example, new customers earn every sixth coffee free, then every fifth coffee free and ultimately their gold members earn every fourth coffee free. To learn more on how you can implement this concept in your business, click here, and you can also read the full case study on our website here. 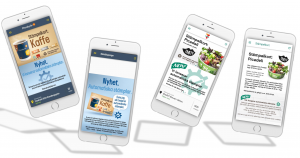 Tiered Rewards within the Loyalty App Created by Reitan Convenience Stores in Sweden.